With the collaboration of composer Dave Soldier, Komar & Melamid's Most Wanted Painting project was extended into the realm of music. A poll, written by Dave Soldier, was conducted on Dia's web site in Spring 1996. Approximately 500 visitor's took the survey. 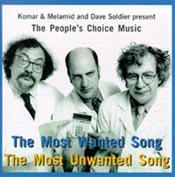 Dave Solder and Nina Mankin used the survey results to write music and lyrics for the Most Wanted and Most Unwanted songs. Ordering information, notes by the composer, and project credits are below. The CD is for sale at Dia's bookstore at 548 West 22nd Street, New York City, at Dave Soldier's concerts, and via a secure server on the web for $12.95. To order via the web, click here for the online bookstore. This survey confirms the hypothesis that today’s popular music indeed provides an accurate estimate of the wishes of the vox populi. The most favored ensemble, determined from a rating by participants of their favorite instruments in combination, comprises a moderately sized group (three to ten instruments) consisting of guitar, piano, saxophone, bass, drums, violin, cello, synthesizer, with low male and female vocals singing in rock/r&b style. The favorite lyrics narrate a love story, and the favorite listening circumstance is at home. The only feature in lyric subjects that occurs in both most wanted and unwanted categories is “intellectual stimulation.” Most participants desire music of moderate duration (approximately 5 minutes), moderate pitch range, moderate tempo, and moderate to loud volume, and display a profound dislike of the alternatives. If the survey provides an accurate analysis of these factors for the population, and assuming that the preference for each factor follows a Gaussian (i.e. bell-curve) distribution, the combination of these qualities, even to the point of sensory overload and stylistic discohesion, will result in a musical work that will be unavoidably and uncontrollably “liked” by 72 plus or minus 12% (standard deviation; Kolmogorov-Smirnov statistic) of listeners. The most unwanted music is over 25 minutes long, veers wildly between loud and quiet sections, between fast and slow tempos, and features timbres of extremely high and low pitch, with each dichotomy presented in abrupt transition. The most unwanted orchestra was determined to be large, and features the accordion and bagpipe (which tie at 13% as the most unwanted instrument), banjo, flute, tuba, harp, organ, synthesizer (the only instrument that appears in both the most wanted and most unwanted ensembles). An operatic soprano raps and sings atonal music, advertising jingles, political slogans, and “elevator” music, and a children's choir sings jingles and holiday songs. The most unwanted subjects for lyrics are cowboys and holidays, and the most unwanted listening circumstances are involuntary exposure to commericals and elevator music. Therefore, it can be shown that if there is no covariance—someone who dislikes bagpipes is as likely to hate elevator music as someone who despises the organ, for example—fewer than 200 individuals of the world's total population would enjoy this piece.